PT Mitra Swire CTM (MSC) is celebrating six years of togetherness. This joint venture which was formed in 2008 is an Indonesian JV between PT MITRA BAHTERA SEGARASEJATI [MBSS] and Swire CTM Bulk Logistics (SCBL). The two parent companies MBSS and SCBL bring together vast experience and expertise in the marine logistics area. During this period MSC has transshipped 22mt (million tonnes), and loaded 324 vessels (from Handysize to Capesize). MBSS (part of Indika Energy Group) is one of Indonesia’s leading integrated service providers of sea logistic and transshipment services, focusing on natural resources and bulk materials. MBSS services range from material handling to transportation of the bulk materials by using barging fleets from loading port to unloading port as well as from loading port to the anchorage point, where the coal is transshipped to mother vessels. MBSS/MSC transshipped 21mt in 2013. SWIRE CTM BULK LOGISTICS is a company 50% jointly owned by the China Navigation Company Limited, part of the Swire Group (a multi-national, multi-disciplined commercial group with over 130 years of experience in shipping) and 50% by DLBC Logistics part of DryLog Group. SCBL combines the experience, know-how and networks of its parent companies in the dry bulk and logistics field, providing a full range of integrated services from the supplier to the end users, including specialized barge services, transshipment, river, coastal and ocean transportation by means of conventional bulk-carriers or self- unloading vessels. These services aim to offer substantial freight savings and therefore add value to its customers supply chains. The MSC partnership was born in 2008 to synergize SCBL’s worldwide experience in the offshore logistic field and MBSS’ Indonesian expertise in providing an integrated logistic services to the Indonesian mining industry. MSC services include off-shore transshipment facilities (floating cranes, floating terminals), tailor-made barges for coal transportation and customized solutions for domestic transport. MSC owns and operates the floating crane Princesse Abby and the floating transfer unit Princesse Chloe, both designed by Italian company Logmarin. The Princesse Abby is a heavy duty marine crane, manufactured by Liebherr, which has been strategically mounted on a pontoon. The Liebherr crane, incorporates specific features for open water and heavy duty conditions such as: customized hoisting winches, strengthened boom, slew bearings conceived with triple roller and four slewing motors. These features help the crane operate consistently in open sea conditions. This new concept of the floating crane was delivered from Subic Shipyard (in the Philippines) in October 2008. The Princesse Abby’s hull structure is made by longitudinal duly reinforced frame with spoon bow, inclined stern and two skegs aft. Movement dampening devices, such as bilge keels fitted on both sides of the pontoon and structural anti-rolling fins in way of the stern skegs, have been incorporated in the design of the Princesse Abby, to increase stability and to maximize the floating crane’s availability. Ocean going vessels up to the largest Capesize type can be loaded by means of Princesse Abby at an average daily loading rate exceeding 27,000 tonnes of coal. Princess Chloe has two heavy duty cranes mounted on a pontoon which work in conjunction to a cargo handling system comprising hoppers, conveyors and a shiploader. The cranes are used to transfer cargo from the barges into the hoppers, thereby reducing the cycle time and increasing daily throughput. The Princess Chloe’s cranes are strategically placed in a way with respect to the hoppers so as to minimize the slewing movement, thereby increasing the cycle time and efficiency. These heavy duty cranes are specifically designed for offshore operations which means they are more robust in construction and are able to perform even in adverse weather conditions. They are guaranteed to operate up to 2 metres of wave height and 25 knots wind speed. The cargo transfer takes places when the floating terminal is safely moored alongside the ocean going vessel with barges moored alongside. The cranes transfer the coal from the barges into the hoppers, which is then transported through the conveyor system and the delivery shiploader to the ocean going vessel’s holds at an average daily rate exceeding 50,000 tonnes. 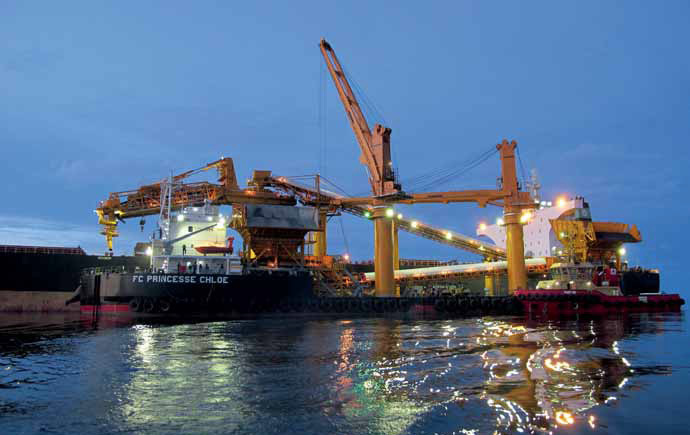 The maximum daily loading rate achieved by Princess Chloe has been 56,000 tonnes which is really enviable considering the system is equipped with two cranes. The swivelling capability of the shiploader, designed and implemented by Bedeschi, ensures serving multiple holds of the ocean going vessels without the need to shift the Princess Chloe alongside. The luffing mechanism of the shiploader is used to cater to the difference in the air draught of the ocean going vessel at ballast to fully laden condition. At the shiploader’s end, a movable banana chute is fitted, to ensure delivery of coal into all areas of the ocean going vessel’s holds which are normally not accessible by a straight chute. This is more important while loading cargoes with large stowage factors like coal, when it becomes important to fill in all the areas of the holds. An automatic sampling device has been installed on the terminal to enable the shipper take samples of cargo as delivered into the ocean going vessels’ holds. It is also equipped with a belt scale to monitor the cargo quantity loaded and a metal detection system to initiate an alarm, if any metal is detected on the conveyor system. By synergizing the capabilities of the parent companies, MSC offers a formidable gamut of activities to its discerning clients. This means MSC as a single agency can potentially deliver from mines to the end user. The sharing of information and expertise between the partners is seamless and both work in complete harmony with the sole aim of providing uninterrupted services to its clients. This is ensured by a well chalked-out maintenance plan, considering the remoteness of the location in which the systems operate and a closely monitored operation programme. The activities are monitored on a real-time basis so that remedial measure can be initiated in case of any anomalies detected.